Every few months, the artist Jon Lomberg kneels next to a croton plant, removes the cheap earring that pierces a speckle on one of its leaves, and fastens a new yellow stud into the same hole. This, he says, pointing to the stud, represents the Sun. 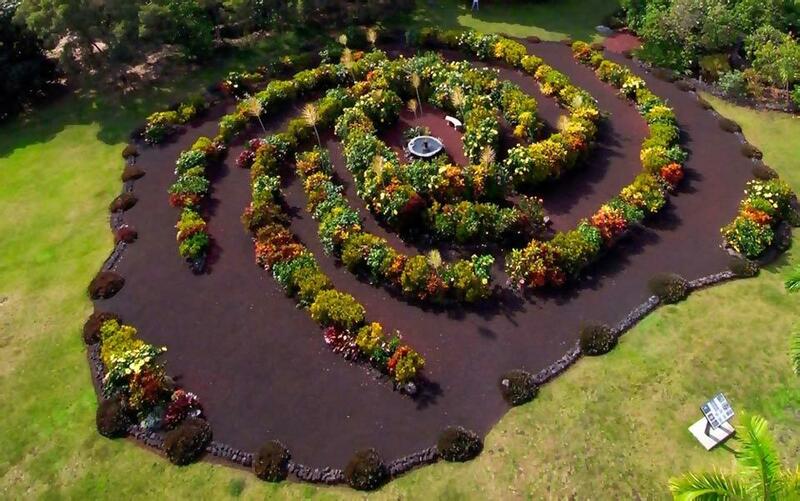 He is standing 30ft from the middle of the 100-ft-wide Galaxy Garden in the Captain Cook district of western Hawai’i. The highly manicured garden is an accurate scale model of the Milky Way galaxy, where every step takes you 2,000 light years from where you stood before. Here, the speckles on the leaves of ‘gold dust’ crotons stand in for stars. The plants reach out in spiral arms from the garden’s centre, where a spouting fountain plays the part of a monster black hole. Along the spiral limbs crowd hibiscus, vincas and red and black crotons where nebulae, gas and dust belong. It is difficult to picture ourselves in the Milky Way. We have no problem placing ourselves within, say, California, or the United States. Even second-graders can point to a spot on a globe and say: ‘I live there.’ And by third grade, they can position that globe in a neat line of planets, telling you smugly that those worlds orbit the Sun, a next-door version of the points of light in the night sky. But beyond that, what? Everything is so distant that we often lump it all into the ‘out there’ category, so that Pluto and Polaris might as well be in the same spot. Perhaps that’s why, as Lomberg says, many people erroneously use galaxy and solar system as synonyms. Only in the past few decades have we become scientifically and technologically advanced enough to situate ourselves within the 100,000-light-year-wide wilderness we call home (where one light year is a distance equivalent to 6 trillion miles). But making heads or tails of galactic latitude and longitude isn’t easy for anyone, including astronomers. We were born inside the Milky Way, and (spoiler alert) we will all die inside the Milky Way. Imagine being trapped inside a building and trying to determine what it looks like from the outside – its layout, when it was last painted, tin roof or shingled? You can catalogue half baths, peer out of a window and describe awnings. But assembling those pieces into a gestalt is like trying to understand your brain using your brain. You’ll never have an aerial view. Now imagine you’ve never heard of this strange concept of ‘building’. That’s the situation astronomers found themselves in until the 1920s. 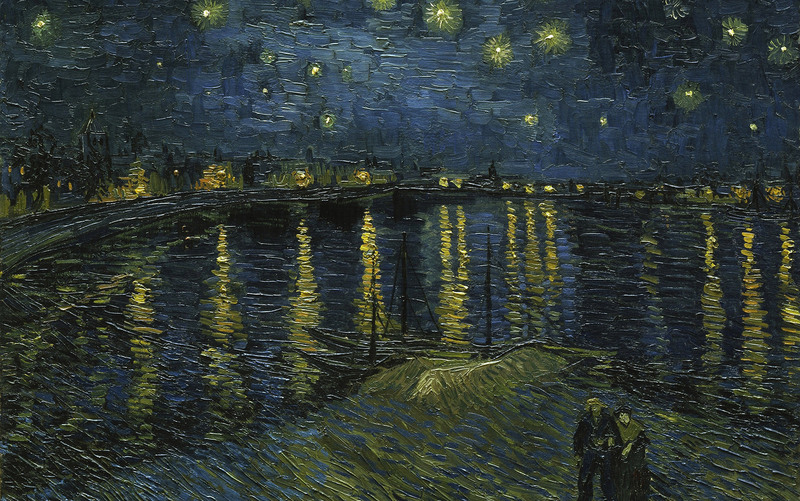 The Milky Way has always streaked our sky, a diffuse stripe spreading from horizon to horizon. Its Latin name – Via Lactea – comes from this fuzzy lane-like appearance. But it wasn’t until Galileo Galilei trained his telescope on it 400 years ago that we knew for sure that it was made of stars – stars just like Sirius, but much further away. As centuries passed, telescopes grew larger, allowing astronomers to detect fainter objects. Looking deeper into space than ever before, they began to see strange helical clouds. Thinking that they were just baroque clouds of gas within our own galaxy, astronomers called them ‘spiral nebulae’. After all, if you don’t know an object’s true size, it could be small and nearby, or distant and huge. And in the late 19th century, the proximate cosmos was the whole cosmos. We had long ago learned that Earth is not the hub of the solar system, but it was the helical clouds, and an argument known as the Great Debate, that pushed the Milky Way off its pedestal. Heber Curtis, director of the Allegheny Observatory in Pittsburgh, suggested in 1920 that the galaxy is just another spiral nebula – simply the one we happen to inhabit. Each other nebula is an ‘island universe’, a Milky Way beyond the Milky Way. On the other side of the debate was Harlow Shapley of the Mount Wilson Observatory in California. If each nebula is an ‘island universe’, he said, the closest – Andromeda – would be millions of light years away. We now know, of course, that Andromeda is an island universe, and that it houses more than a trillion suns. So do other galaxies 13 million, even 13 billion, light years away. Not only is the Milky Way not the entirety of the Universe, it’s not even a remarkable galaxy. The good news is, this ordinariness is what gives us a chance to describe our ‘building’ from the outside. We can count on the Milky Way to look and behave like an average spiral galaxy, and the Universe contains tens of billions of those. Wherever we look in the Universe, we see the laws of physics – the strong and weak nuclear forces that make atoms tick; the electromagnetics that attract opposites; the gravity that orders orbits – moulding gas into stars, and stars into galaxies. Peering out of our cosmic window, we can survey these structures to learn about our own. If the spiral nebulae we see have arms and bulges, perhaps the Milky Way sports them, too. From the side, the Milky Way is a thin disk with a bulge in the middle. From above or below, it resembles a hurricane, with spiral arms where rain bands would be. Four of them curl from the eye of the storm. The Perseus Arm and, interior to it, the Sagittarius Arm wrap around our side of the Milky Way, while the Scutum-Centaurus and Norma-Cygnus arms form a near-mirror-image on the other side. A stream of stars forms a curved lane between Perseus and Sagittarius. It is on this 15,000-light-year-long branch, called the Orion Arm, that our Sun sits. For a long time, astronomers believed the Orion Arm was insubstantial. Last June, however, they discovered our arm is a major appendage in its own right, more like Perseus and Sagittarius than like a minor spur. That’s a pretty basic discovery to make so late in the game. But nearly all knowledge of galactic limbs comes from invisible parts of the light spectrum, studies of which are – relative to the optical astronomy that began with Galileo’s telescope – in their infancy. Until extrasensory telescopes augmented our anatomy, we couldn’t sense the spiral arms. Scientists didn’t discover them until the 1950s, with the first radio surveys of hydrogen gas. From these simplest atoms, radio waves 21cm long cut through the thick curtain of particles that stands between us and the other side of the Milky Way. Those particles block the visible light, but longer-wavelength radiation zips right past them, just as FM transmissions pass right through the walls of your house. Radio waves and infrared radiation also shed light on how spiral arms move and why they exist in the first place. Although their shape suggests that they rotate with the galaxy, carrying stars along with them, they move at their own pace, like terrestrial traffic jams. While cars bottleneck, they eventually crawl out the other side. The traffic overdensity itself, however, persists. And so do spiral arms, which contain about 10 per cent more stars and gas than the rest of the galaxy. The Sun’s slow passage through the Perseus-Orion jam will take some 10 million years in total. After that, our star will be in a limbless space for 100 million years. All spiral arms lead to the Milky Way’s centre. There, a bar of stars in long, looping orbits forms the tapered shape of a cat’s pupil. This eye is 27,000 light years across – nearly as wide as the distance between Earth and the galactic centre – and pokes out of the galaxy’s plane at a 45º angle. Above and below this midsection, nearly 200 spheres, each packed with hundreds of thousands of ancient stars, orbit. Out of the Milky Way’s plane, these ‘globular clusters’ live their long lives in isolation from each other and the rest of the galaxy. If Earth were inside one of them, our night sky would beam down thousands of stars as bright as Sirius. At the very centre of the galaxy, 27,190 light years from Earth, sits the Milky Way’s most significant object. Our fastest spacecraft would take 475 million years to arrive at its boundary, beyond which 4 million suns-worth of mass is squished into a singularity. This supermassive black hole, called Sagittarius A*, appears to orchestrate galactic motions, making every last atom its satellite, but this is an illusion. Everything orbits the centre of mass – the point at which the gravitation from all directions is the same. Just as the Earth spins on its axis and revolves around the Sun, the whole Milky Way whirls around the centre of mass. Even Sagittarius A*, very slightly offset from the galaxy’s true centre, does a delicate jig. The region around the black hole is dense with dust, which blocks and scatters visible light. Because no optical telescopes could see to the centre, astronomers did not find evidence of Sagittarius A*’s existence until 1974, when radio telescopes became powerful enough to nail the precise location of a strangely compact source of radiation that coincided with the galactic bull’s-eye. A disk of swirling material surrounds Sagittarius A*. Stripped from stars and gas clouds, these rub against each other as they move. The friction heats things up, causing the disk to glow with radiation. Sometimes, an unfortunate clump of matter falls past the black hole’s event horizon – the point of no return – and the only memorial is a burst of photons. In the 10,000 light years right around the black hole, 10 billion stars bulge in a peanut shape. When astronomers look at the farther-out orbits, such as that of our Sun, the motions don’t perform as expected. The speeds depend on distance from the galactic centre and the amount of mass inside the orbit. Given that we’re in the podunk part of the Milky Way, low-density and far from the middle, our orbit should be slower. But the Milky Way’s farthest-flung suburbs have the same pace as its New York Cities. 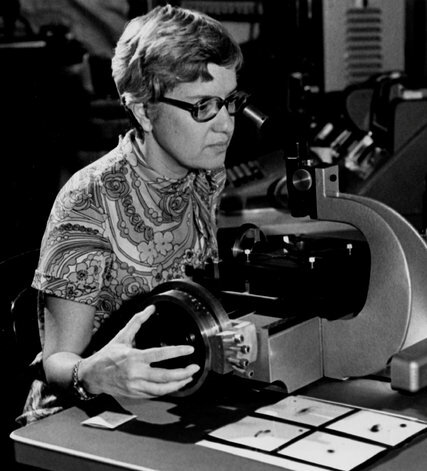 Vera Rubin, a researcher at the Carnegie Institution for Science in Washington DC, observed the same surprising motions in other galaxies in 1970. Here, dark matter enters the picture. To generate enough gravity to make the Sun orbit so fast, 80 per cent of the galaxy’s mass must be missing. Black as space, this dark matter pervades the Milky Way – including the solar system and maybe the space next to you right now – and forms a huge halo around the visible galaxy. 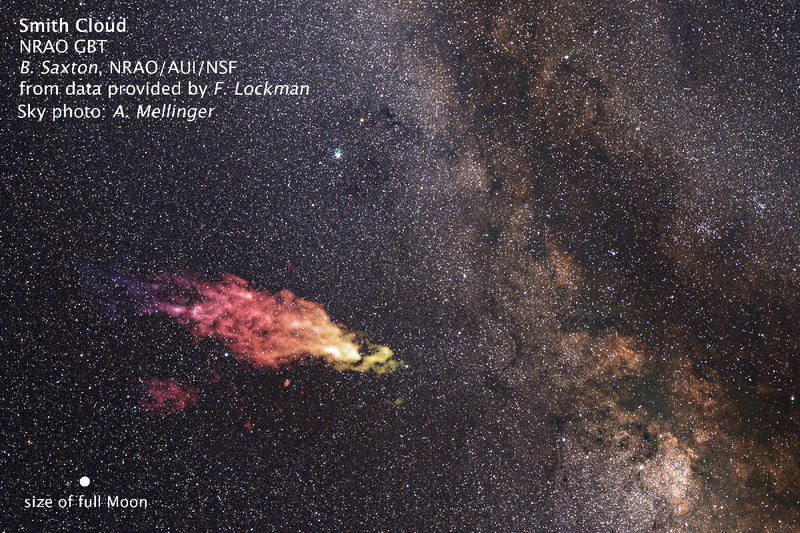 And while this invisible cloak might be the most mysterious of the Milky Way’s shrouds, it is not the only one. A balloon of gas also envelops us, extending hundreds of thousands of light years beyond the galaxy’s visible borders – farther from the galaxy’s edges than the galaxy itself measures from edge to edge. If you could ball up this hydrogen, you could create at least 10 billion new stars. Even more hydrogen streams in from extragalactic space. Clouds of high-velocity gas come from smaller, nearby galaxies after the Milky Way’s immense gravity re-routes them. One known as Smith’s Cloud weighs more than a million suns, but it’s spread so thin that it fills as much sky (or it would, if you had radio-sensing eyes) as the Orion constellation. When it arrives 30 million years from now, it will set off a burst of star formation. Snacks such as the Smith Cloud will allow the Milky Way to continue making new stars, even after it has consumed the food on its own plate. The Milky Way sometimes likes to steal sustenance from the Large and Small Magellanic Clouds, which can be seen orbiting our galaxy on dark, clear nights in the Southern Hemisphere. Magellanic Bridge ESA_Gaia satellite. Image credit V. Belokurov D. Erkal A. Mellinger. But the theft does not go unavenged: the Magellanic Clouds might have turned the Milky Way into a warped and vibrating thing. As they move through space-time, they create a wake, just like rocks skipped across water. The undulations bump into our dark matter, bending the galaxy. Its edges flap and wave on timescales we can never experience. If you stand where the Sun’s earring is and survey the fecundity around you, it’s easy to believe that you actually do live inside something larger than your world. Lomberg believes this cosmic swaddling – and the accompanying smallness – should be part of our mental toolkit. If you zoom out of the Milky Way entirely, you’ll find 26 known dwarf galaxies orbiting us. It’s likely that 1,000 more are hiding out there, some nearly invisible, and made mostly of dark matter or cold hydrogen gas. Beyond them lie the other members of the Local Group. These galaxies, 54 of which are known, travel together through space, and their gravitational centre lies between our galaxy and its nearest large neighbour, the Andromeda galaxy. Around the Milky Way and Andromeda, 12 other large galaxies form a protective circle known as the Council of Giants. The gravitational tethers that bind these galaxies are strong enough to resist the dark energy that is pushing everything apart, and getting faster every femtosecond (or one quadrillionth of a second). The Local Group is part of the Virgo Supercluster, which contains more than 100 galaxy groups and clusters, but even this structure is cosmically insignificant. Just as Earth is one of many planets, the Sun is an average star, and just as the Milky Way is a predictable spiral galaxy, the Virgo Supercluster has 10 million massive siblings. That number hardly means anything to those of us who are five or six feet tall, perhaps travel to a foreign continent once, and die when we’re 85 if we’re lucky. But imagine that the Galaxy Garden really is the galaxy: the visible Universe would be the size of Earth, and it would be immaculately landscaped with hundreds of billions of Galaxy Garden clones, all congregating in clusters and superclusters. Long filaments of gas and dark matter bridge superclusters, connecting them across voids. If you could see it from afar, the cosmos would look a lot like a brain: a collection of neurons, where each supercluster is a bright dendrite, and each filament an axon.